When it comes to gammon there’s no improving on tradition, and at Chadwick’s we know how to turn a generous cut of pork into a festive joint that’s popular year in, year out. 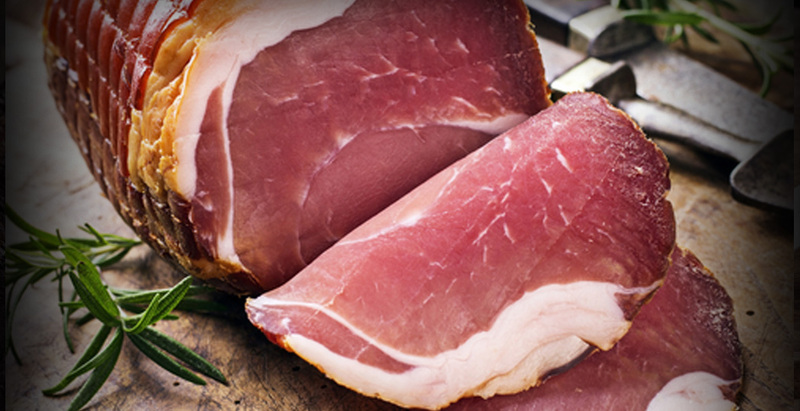 Our Gammon is rubbed with salt, hand-cured and air-dried in a traditional process that ensures great flavour. Our gammons start their journey, like our hams, as a free range leg of pork from the surrey marshes. Once removed from the pig, we ‘Double cure’ the leg, first by curing for 14 days in a dry cure salt mix, then once this process is complete they are washed then cured with a sweet cure mix for a further 7 days. After the double cure process is complete we then soak the gammons in a vat of whiskey & ale. The soaking removes any excess salt and adds a subtle flavour whilst also helping to further tenderise this amazing product. Not finished yet!!! We then hang the gammons for a further 2-3 days to remove any excess moisture. Once hung we cover in cloves & marmalade and place in a cooking bag for your convenience. Simply superb!